For us Social Distortion fans, Hard Times and Nursery Rhymes has been a long time coming. Apart from the new song, new cover and rerecordings found on their 2007 Greatest Hits, the last “new” music to come from their camp was way back in 2004. Throughout that time, Mike Ness and company weathered the passing of a former member, label troubles, lineup changes and constant touring. However, if those issues contributed to the power, emotion and direction found on the new album, I’m sure everyone will forgive the wait. Not only does Hard Times and Nursery Rhymes contain some of Social Distortion loudest guitars and finest vocal performances to date, they even throw in a couple new sonic twists and turns not usually found on their records. While no one could deny that Mike Ness is Southern California punk rock through and through, Hard Times and Nursery Rhymes displays a range of influences including their familiar splashes of country, a little blues, straight up rock and roll and even some southern rock elements. But don’t worry, their calling card of huge guitars, snarling vocals and a pounding rhythm section are all over this bombastic and diverse album. Hard Times and Nursery Rhymes powerfully kicks off with “Road Zombie,” a driving instrumental full of fiery guitar leads and pulsing drums. Social Distortion has been using this song to open shows for awhile now so it’s a natural fit and a great choice for an album intro. “California (Hustle and Flow)” is up next and immediately lets you know that they’ve got a few surprises in store. The song is based around a bluesy rock riff and is surprisingly enhanced by some soulful gospel background vocals. In fact, it sounds like the Social D boys have been listening to The Black Crowes or even some Lynyrd Skynyrd. The swampy vibe and sassy bgv’s show up on tracks like “Can’t Take It With You,” “Bakersfield” and “Writing On the Wall” as well. They don’t let the background singers have all of the shining vocal moments though as “Diamond In The Rough” impressively showcases some of the best harmonies they’ve ever sang. This one guarantees to be a huge sing-a-long at shows. Continuing in the vein of choosing awesome country covers like Johnny Cash’s “Ring of Fire,” they turn in an amped up version of Hank Williams’ “Alone and Forsaken” that manages to really tap into the sadness of the song while it chugs along. Those down-stroked power chords that they rip through so well propel the groove of “Gimme the Sweet and Lowdown” and “Still Alive” as well. 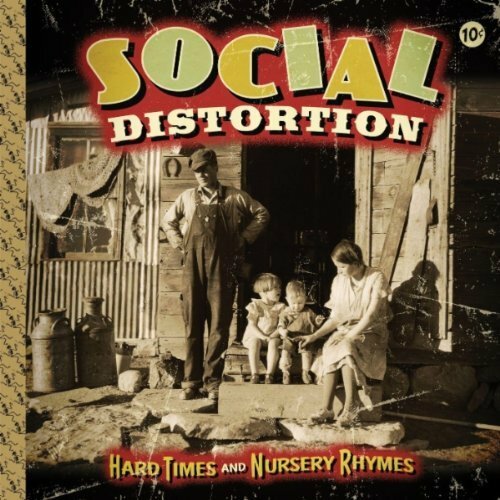 The first single from the album is “Machine Gun Blues” and for all the new ingredients on Hard Times and Nursery Rhymes, this one is classic Social Distortion. “Machine Gun Blues” is full of attitude, growling music, a big chorus and lyrics about seedy characters, cars, crime and other noir elements. Social Distortion definitely rewarded fans with a powerful album that proved to be worth the wait. Hard Times and Nursery Rhymes will be available from Epitaph Records on January 25th.